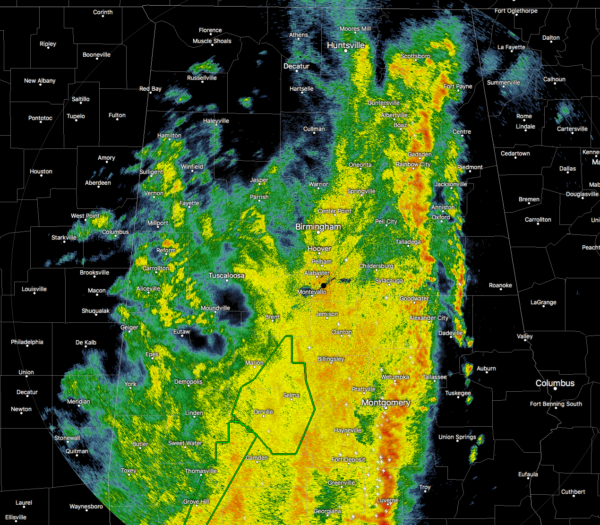 The leading edge of the line of storms has now made it into the eastern parts of the state, stretching from Fort Payne to Alexander City to Troy. The good news is the back edge is really starting to dry out some and rain has come to an end for much of the northwestern corner of the state. No severe watches or warnings are in effect at this point, but a Flash Flood Warning continues in effect for parts of Dallas and Perry counties until 3:15 AM Sunday. The severe threat for much of Central Alabama has diminished, but damaging winds of 40 to 60 mph are possible through 2:00 AM for areas along and south of a line from Montgomery to Auburn. Rainfall amounts of 2 to 5 inches, with isolated higher totals, could lead to flash flooding through 5:00 AM. The best chance of flash flooding will be in an area bounded by Birmingham to Gadsden to Montgomery to Demopolis. The Tornado Watch that was in effect until 2:00 AM for Dallas and Lowndes counties has been cancelled. The threat of severe storms has diminished and the watch has been cancelled. The Flash Flood Watch has been extended in time for Autauga, Bibb, Blount, Calhoun, Chilton, Coosa, Dallas, Etowah, Hale, Jefferson, Lowndes, Marengo, Perry, Shelby, St. Clair, and Talladega counties until 5:00 AM. 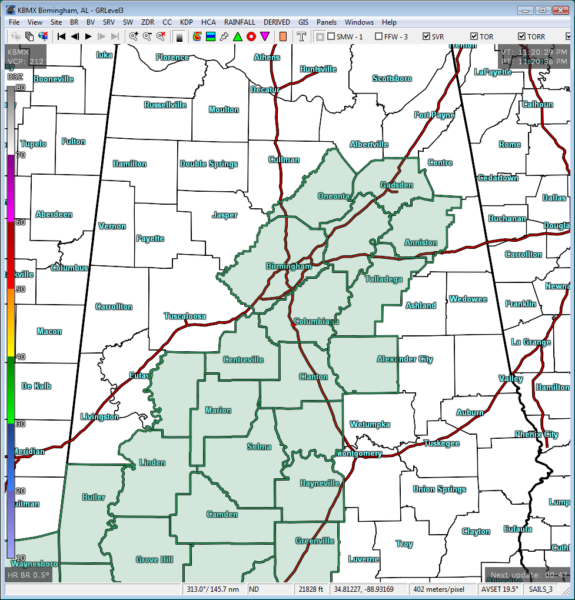 The Flash Flood Watch in effect for Fayette, Greene, Lamar, Marion, Pickens, Sumter, Tuscaloosa, Walker, and Winston counties has been cancelled. Heavy rain has ended and moved east; therefore, the flooding threat has ended and the watch has been cancelled.